Moments of Tranquility... by Natasha Naranjo Aguirre: Swirlydoos' November Kit Reveal Blog Hop! Welcome to Swirlydoos' November Kit Reveal Blog Hop BLOCK PARTY!!! That's right... we are having a party and you are all invited. If you came here from Petaloo's blog, then you are on the right track. Otherwise, go back to Swirlydoos' blog and start from there. We have some amazing projects for you to see today, and as a bonus, we have 3 manufacturer blogs that are joining in the fun!! But wait! We also have a Guest Designer along for the ride this month... Natasha Naranjo Aguirre!!! Squeeeeeeee.... that's me! *confetti in the air and noise makers galore* LOL! There are 5 prize packs up for grabs so make sure to follow along and have fun!! Let me show you what I created with this beautiful kit! CLICK HERE FOR DETAILS ABOUT THIS LAYOUT. MemoriesCLICK HERE FOR DETAILS ABOUT THIS LAYOUT. Treat BoxCLICK HERE FOR DETAILS ABOUT THIS PROJECT. You have until midnight, eastern time, on November 9th to complete the hop. In order to qualify to win here is what you need to do: 1: Visit all EIGHT blogs and leave a comment on each. This way we know you were there. :) Become a follower if you're not already. Grab a cuppa somethin' and take your time. There are beautiful things to see along the way.2: Before you leave each blog, look for the “special” word and write it down. Once you have visited all the blogs and collected all the special words, they will create a sentence. 3: Finally, head back to the Swirlydoos blog ( http://swirlydoos.blogspot.com) and leave a comment letting us know how much fun you had AND tell us the sentence that was created with all of the special words you collected. My special word is TRIUMPH. All winners will be randomly drawn. Winners will be posted over on the Swirlydoos blog on the 10th, which also happens to be the same day November's SwirlyHues Contest is unveiled. YAY!! Go forth and have a great time!!!! Your blog hop block party continues over at Clearsnap. PLEASE NOTE: When leaving a comment on my blog, please make sure you are leaving a comment for THIS post. 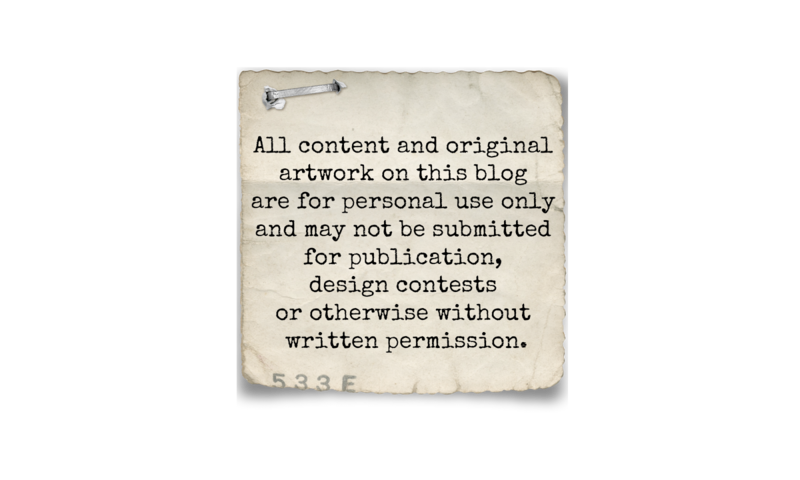 My blog template is a little strange and comments are often left for the wrong post. Click HERE to be directed to the comments section. I don't want anyone to miss out on a chance to win! Thanks! Congratulations on these mind blowing projects- just when I feel like I've taken it all in I look at a detail shot and notice another great "touch" to admire- it's your wonderful complexity and craft knowledge that I admire most. Off to check out the hop- I've been using Petaloo flowers a lot lately- they are so versatile! Oh my....your name for your blog fits your work so well. Love your work! You're an inspiration...TFS. Love your work,my favorite was the blue layout! Amazing layouts! I couldn't begin to replicate them, but I sure have gleaned a lot of ideas from your amazing creativity! I just had to come here for a closer in depth look!! !Really love all the work on the box...Hugs!!! Amazing job, love all of them! Thank you for the inspiration. Wow! You created a masterpiece (again)! Love the rich details and the paint you added! So many wonderful details to look at here! Awesome job! Amazing work.. Beautiful layout.. Just loved it.. Thanks for this blog hop, its new learning all way..
Wow Wow Wow...... Your work with this month's kit is just soooooooo BEAUTIFUL!!!!!!! Love your punchwork and masking and oh my.... THOSE FLOWERS..... I simply love every single page!!!!! The treat box is awesome! Your layouts are incredible -- such wonderful detail! I'm a follower now -- by email and on your blog! Stunning projects. I love all the details you've added to your work. Your stitching, design and those beaded flowers are the perfect touch. SO happy that you were able to guest design with us this month. Your pages are all so stunning! Loved your work - blue is my fave color!! I am a follower, love your gorgeous attention to detail. I love your hand stitched flourishes. Gorgeous! Thanks, as always, for the inspiration. Looking forward to your live chat at Swirlydoos. Oh Natasha! You have been such an inspiration to me in the last year! Every single creation of yours is just exquisite!!! Love all the details you put into your layouts and projects. You have done amazing things with this kit. I am now a follower. Beautiful layouts and I adore that treat box! The projects are so filled with great details, it's amazing. I love the work. I love the stitching you put on a page!!! All your pages are so beautiful!!! Wow, I LOOOOOOOVE your stitching and your work is simply gorgeous!! Thnaks for the chance to win!! WOW!! I'm so excited to see what yuo did with this kit!! It is all so delicious!! Thank you so much for the inspiration!! Whoops ... I think I left my comment in the wrong place. I just wanted to say that I absolutely LOVE the "memories" page. It is so detailed, so feminine, so ... gorgeous! Thank you for sharing it! Huge congrats on your guest design spot, Natasha! Gosh, you've seriously outdone yourself with this kit! As always you've done the most gorgeous work with these products. 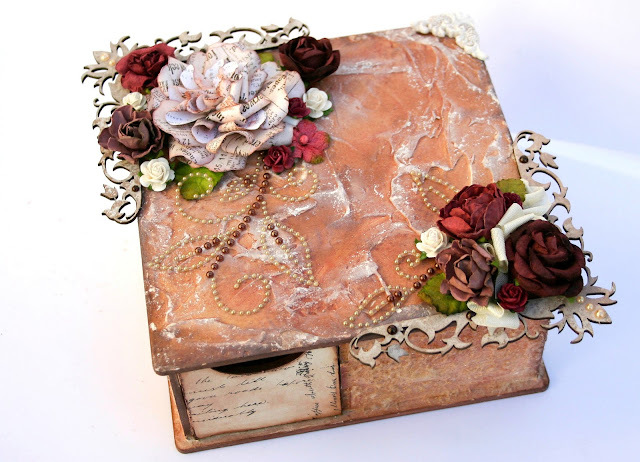 I adore all the stitching, stamping, distressing and other unique techniques that define your elegant and shabby chic style of scrapbooking. Such amazing work! Gorgeous layouts, love your stitching, distressing and layering detailing. Thank you for sharing. Im a new follower. the details are just mind blowing! Gorgeous details! I am in love with the blue layout. your work is lovely. i especially enjoy the little details you've incorporated. Your work is amazing! I love all the little details you put in. Oh my.....your work is just exquisite!!! I love your style, your details, little surprises every place your eye falls! Just gorgeousness. I am in love with your creations!!! So glad you're in the blog hop!!! Such a beautiful box. I just love it. Beautiful flowers. Thank you so much for sharing it. Natasha, your attention to detail is inspiring...wow! Love your projects! The beaded flowers are so perfect and I am going to have to learn how to do that weaving thing with the tulle. you have works of art on your post. Very lovely! I love your work. Keep going back and looking at the heart box. Your work is incredible. Love your work! Your layouts are beautiful! I also like the daisies in your blog background! Amazing I absolutely love your work. Hey, my daughter's name is Natasha, too! WONDERFUL NAME! Anyway, I really like the beaded flowers. So pretty. Oh Natasha - your babies are so beautiful! Your layouts are gorgeous too LOL. You just do beautiful work all the way around don't you :) Love the treat box too. All those luscious flowers! Thanks for sharing the amazing projects! So wonderful with all the layers and elements used together. I had look up how you did the box. I never would have thought to use stucco. I just adore all the layers and details you put into your work... lovely! OOOOOH MY!!! 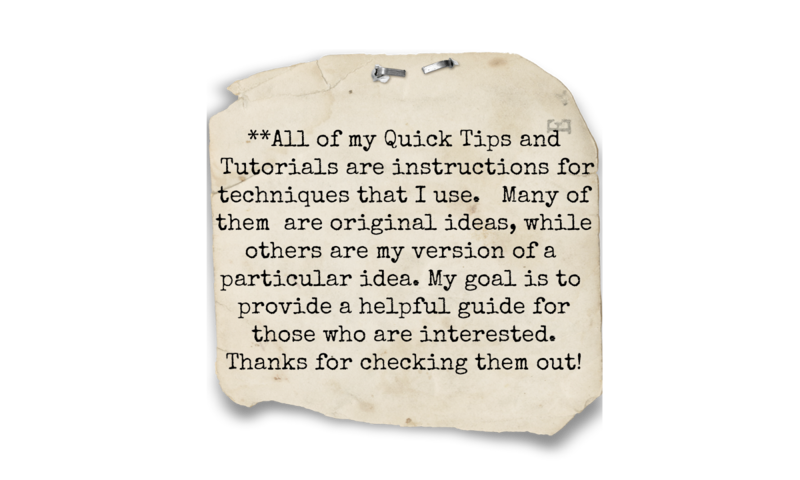 Thank you for sharing your blog and all your tutorials... I LOVE everything I see. Your work is incredible!!!! GOGRGEOUS layouts and altered box!! Beautiful layouts! So much detail, love all the stitching! oooooh wow, and wow again. each project so very stunning. that detail, stunning. Awesome layouts. Thanks so much for always sharing such great detail about your process. Natasha, Amazing work and wonderful talent!! Your projects are gorgeous and I love the kits!! Your projects are what I dream of mine to look like!! Your designs are so beautiful, colorful and really tell the perfect story. Great job. Truly stunning work! Congrats on being Guest DT! Totally deserving! What beautifully intricate projects these are! This entire blog hop has been eye candy overload for me. Thank you so much for inspiring me and congrats on being selected as a guest designer! Your work is fabulous! I'm so excited about your "guesting" at Swirlydoos!!! I've been looking at your projects and reading the "how to" details, thanks so much for the inspiration!!!! Your projects are all beautiful. I like how you have both a boy and girl layout. Such beautiful projects! Thank you for sharing. Thank you for sharing your creative talent. Especially love your Donna Flower tutorial. Your LO's are just stunning! Your detail work is amazing! I'm so excited your our guest designer at Swirlydoos! Your work is just amazing and beautiful! I am a huge fan of your work! This project is gorgeous...Such a beautiful display of art. WOW!! I love the flourish sewing that you did!!! Everything is so gorgeous... thanks for the inspiration! Love love love your work with the kits!! And thank you so much for Guest Designing with us this month!! Incredible! your creativity is out of this world! love your layouts!!! Natasha, your layouts and projects are stunning. I love your unique touches. I have never visited your blog before, but I shall be visiting again in the near future. Your work is gorgeous, and I love the falling stars on your blog. Fun! Natasha, you inspire me to a whole new level. your LO's are so detailed, so incredibly detailed, that i push myself to do more, and i thank you for it! so happy you are a guest designer this month, and hope to see you here more! So many beautiful things you make. Whoops. I thought I left a post, but I don't see it. Anyway, absolutely LOVE everything you do. Beautiful pieces of art. Very inspiring. I am definitely going to follow your blog!! Once again, your layouts are fabulous. I've been following you for a while now and I'm never disappointed in getting inspiration from your designs.